Mix up your mealtime with our Shredded Tostada Salad. This quick Tex-Mex salad is a delectable medley of fresh lettuce and peppers, corn, beans and cheese, without the hassle of stuffing a shell. Shred 1/2 head iceberg lettuce and combine with 1/2 cup each chopped red pepper, corn and black beans, drained and rinsed. 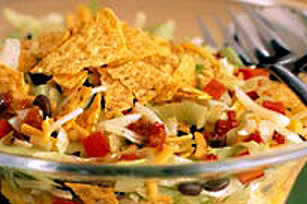 Add 1 cup each KRAFT Tex Mex Shredded Cheese and crushed nacho chips in a large serving bowl. Toss with 2 tbsp. KRAFT SIGNATURE Sundried Tomato & Oregano Dressing and serve.